I haven't really been posting about Project Runway because, well, I haven't been impressed with the things that they've been making. Also because I can't understand how Ricky is still in the competition and Kevin and Kit aren't (not that I was expecting Kit to stay until the end, but there's no way you can tell me that Ricky is more talented than she is). Anywho, the dress that Christian and Chris made last night was AMAZING. I can't believe that they did this in 2 days, it looks so well done and it is SO dramatic! If they didn't win this challenge, I was going to give up on the show entirely. But they did, and that's what matters. I think they were the only ones that really understood what Avant Garde is, at least in the way that it relates to what the judges wanted to do. And I think that that's really disappointing and speaks very little of the other designers' knowledge about fashion (as much as I love the others too). We'll see what crazy thing they have to make next week that involves a garage in a pier. And no, I'm not going to sign off on this post by saying Auf Wiedersehen. 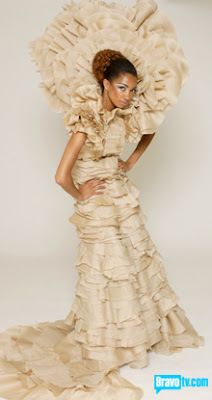 Wow... that is beyond my expectations of Project Runway designs.... really QUITE beyond! It IS, isn't it? I still can't believe it, really. I hate using the word fierce but...it's fierce! Completely gorgeous, the ruffly collar makes me swoon.